There is currently just the 1 ferry route running between Faial and Flores operated by 1 ferry company – Atlanticoline. The Horta to Lajes ferry crossing operates weekly with a scheduled sailing duration from about 9 hours. Whilst we’ve taken great care to ensure the information on this page is correct, as the frequency and duration of crossings on all routes can vary from time to time we’d advise that you get a live quote for current availability on this Faial Flores crossing between Horta and Lajes. 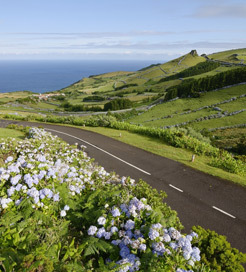 Flores forms part of the Western Group in the Portuguese archipelago of the Azores, a group of small islands spread across the North Atlantic. The island gets its name from the prevalence of wild flowers, mostly blue or pink in colour, and many other indigenous botanical species. The floral population also earned Flores a place on the UNESCO World Biosphere Reserve list in 2009, so you’re guaranteed some breath-taking scenic walks. Flores also has plenty of exciting opportunities for climbers and mountaineers. Particularly the Groto de Enxareus, a vast cavern measuring fifty metres long and twenty five metres wide. Morro Alto is the highest point, reaching over nine hundred metres, offering wonderful views of the crater lakes as well. In terms of cultural appeal, Flores is home to the westernmost town in Europe, Faja Grande, whilst the small town of Fajazinha on the west coast is known for its pretty, ruinous water mills and white washed houses. 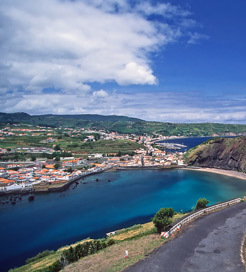 You can reach Flores from every island in the Azores by ferry, arriving in Lajes Das Flores on the south coast. There are slightly more sailings from the neighbouring island of Corvo to the north. Ferries on this route also dock in Santa Cruz, found just up the coast.